Gerard Depardieu, who stirred up controversy by becoming a tax exile last year, has thrown a big housewarming barbecue in Belgium. The 64-year-old actor invited some 200 people, including his new neighbors, to celebrate in the grounds of the five-bedroomed chateau he bought in Nechin in December. Gerard Depardieu bought the property after France’s Socialist government proposed a 75% tax rate on high incomes. The tax hike was later blocked by France’s highest court. Since it was proposed last year, Gerard Depardieu has also taken on Russian citizenship, in a move much criticized in his home country. Hailed as one of the finest actors of his generation for films that include Cyrano de Bergerac, Gerard Depardieu told reporters he was a “citizen of the world”. “I have worked around the world but I settled in Nechin,” he said. Saturday’s feast reportedly featured T-bone steaks and suckling pig. 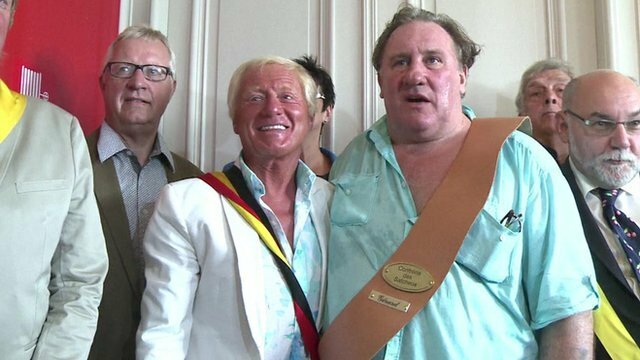 Earlier in the day, Gerard Depardieu was made an honorary citizen of Estaimpuis municipality, which includes Nechin. Daniel Senesael, the mayor of Estaimpuis, said: “When he came to set up house here, he always told me that he wanted to do something nice with the neighbors. Gerard Depardieu told France’s Figaro magazine on Friday that the tax controversy had been “a big misunderstanding” and that he loved France “as much as ever”.